The connection between hormonal contraception and breast cancer is murky, because the association is difficult to study properly. There are so many different types of hormonal contraceptives, each with different dosages, different chemical formulations, and different ways of entering the body. We can’t tease these differences apart on the one hand, but make blanket statements about hormonal contraception as a whole on the other hand. But we can look at the available evidence and see where it points. Before December’s study was published, most people thought older versions of the birth control pill were probably linked to small increases in breast cancer risk, but that more modern birth control pills, with lower doses of estrogen, were not linked to breast cancer at all. 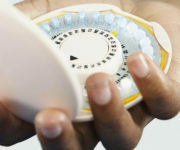 Most studies were conducted when the Pill had higher doses of estrogen, and before estrogen-free forms of hormonal contraception were available. People also thought that different types of birth control, such as the vaginal ring or the IUD, could deliver hormones in a more “targeted” manner, having less effect on breast tissue. So the hope was that modern contraception — with lower doses of estrogen or no estrogen at all, or that delivered hormones in a more specific way — would have less risk. One large study, published in 2010, found that only “triphasic” pills, which contain a form of progestin called levonorgestrel, were associated with increased risk — a result that came as a surprise to the medical community, and led to speculation that maybe other forms of progestin were safer. In 2013, an analysis of the available evidence showed that using the birth control pill increased lifetime risk of breast cancer by 0.89 percent — a tiny increase, but one that statisticians did not deem likely to be due to chance. So, the consensus was that birth control pills possibly carry with them a slight increase for breast cancer risk — but there were a lot of unanswered questions. Did more modern forms of contraception carry even less risk, if any at all? And were only certain types of progestin, like levonorgestrel, the culprit for the small overall increase in risk? Last month’s study compared users of hormonal contraception to women who had never used it, and found that current and recent users had a 20 percent higher risk of breast cancer. What’s more, those who had used hormonal contraception for more than a decade had a 38 percent increase in breast cancer risk. 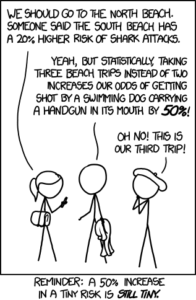 That might sound huge, but risk always needs to be put in perspective. If your chances of getting cancer are already small, a 20 percent increase in that risk will not dramatically alter your absolute risk. The study’s authors kindly put those numbers in a context that might be easier to grasp: For every 7,690 women using hormonal contraception, there will be one additional case of breast cancer each year. Nevertheless, these results challenged the widely held belief that only older forms of the Pill might increase breast cancer risk. But what about progestin-only birth control? The form of progestin called levonorgestrel continued to raise red flags: Current or recent use of progestin-only IUDs containing levonorgestrel was associated with a 21 percent increase in breast cancer risk. Additionally, progestin-only pills containing levonorgestrel were associated with a 93 percent increase in risk. The authors didn’t just lump all forms of hormonal contraception together to come up with that 20 percent overall increase in breast cancer risk — they also looked at different types of contraception individually. Organizing the data this way helps us understand if some types of birth control might carry less breast-cancer risk than others — but dividing the overall group into more than a dozen subgroups leads to a loss in statistical power, so only a few results were statistically significant. There weren’t enough data to evaluate risk associated with other forms of progestin (norethisterone, drospirenone, and dienogest combined with estradiol valerate) used in combined birth control pills. Results for progestin-only pills using norethisterone or desogestrel weren’t statistically significant either. “Small but significant”? What does that even mean? The “small but significant” increase in breast cancer risk simply refers to the finding that hormonal contraception slightly raises breast cancer risk, and this slight increase in risk is unlikely to be due to chance. Last month’s study was a bombshell in many ways, but it had its weaknesses as well. Some doctors say that yearly visits to obtain birth control prescriptions increase opportunities to detect breast cancer, and the study did not control for health-care visits. The authors also weren’t able to adjust for other factors that might influence breast cancer risk, such as alcohol consumption, physical activity, age of first menstrual period, or breastfeeding. It’s also important to remember the “good” side effects of the Pill. Not only is it good at preventing pregnancy — and all the health and lifestyle implications pregnancy carries with it — it can also help people with painful or heavy periods, and conditions like endometriosis. And, when it comes to cancer, the Pill seems to reduce users’ risk of ovarian cancer, endometrial cancer, and possibly colorectal cancer. So is the Pill good or bad? That’s a question only you can answer for yourself — taking into account your family history, your other risk factors, how much risk you’re willing to accept, and the benefits the Pill can provide. If you’re worried about how the Pill could affect your risk, make an appointment at your local Planned Parenthood, where a health care provider can review your options with you and help find something appropriate for your lifestyle and preferences. This entry was posted in Birth Control, Cancer and tagged birth control, birth control implant, birth control patch, birth control pill, birth control shot, breast cancer, cancer, combined oral contraceptives, contraception, contraceptive implant, contraceptive patches, cyproterone, Depo Provera, desogestrel, dienogest, dosage, drospirenone, endometrial cancer, estradiol valerate, estrogen, ethinyl estradiol, gestodene, hormonal birth control, hormonal contraception, intrauterine device, IUD, levonorgestrel, non-hormonal birth control, non-hormonal contraception, norethisterone, norgestimate, ovarian cancer, progestin, progestin-only birth control, progestin-only birth control pills, risk, side effects, statistical significance, statistics, the Pill, vaginal ring by Anna C.. Bookmark the permalink.